When it comes to designing a restaurant, communicating your brand effectively and using available space is an important place to start. With SpeedPro Imaging’s unique mix of products and services, we can deliver a brand experience like none other for your restaurant patrons. What follows below is six great products to consider for your restaurant’s interior design. We hope you feel inspired and contact your nearest SpeedPro Imaging studio today! Wide-format wall murals in luscious, living color make a big splash in a dining room or behind a bar. 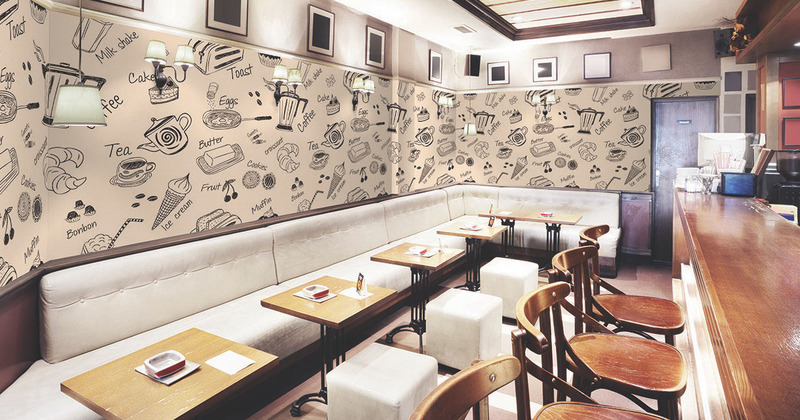 Take your atmosphere up a notch and transport guests to an immersive dining experience by incorporating transformative wall murals and designs into your décor. Learn more. To get noticed in a crowded marketplace with thousands of tasty offerings, your restaurant needs professional display graphics that pop. Custom signage announces your brand and visually enhances its flavor profile. Whether it’s a foam core print for an eye-popping promo or digital display, we have solutions for any and all custom signage and graphic needs. Learn more. Transform a plain storefront, patio or sidewalk into a striking and impactful branding tool that makes your restaurant stand out. Custom window graphics and floor clings showcase your restaurant’s enticing ambience and experience, while catching the eye of anyone who passes by. Learn more. Etched glass designs are the perfect way to add eye-catching elements to your restaurant’s décor, while creating an upscale, modern ambience. Perfect for glass partitions and screens or exterior, bathroom and kitchen doors, etched glass adds simple interest and instant soft lighting to any environment. Learn more. Whenever your product leaves your restaurant, your message should go with it. Get attention at home with custom to-go labels, as well as on-the-road with fleet and vehicle wraps for catering delivery or food trucks. After getting an eyeful of your mouthwatering fare on a custom vehicle wrap, hungry passersby will have no choice but to check out your restaurant. Learn more. Whether you’re hosting live music entertainment, a food fair or fundraiser, make your restaurant stand out and draw in the masses with customized booths and banners. Overhead banners and custom printed canopy tents quite literally stand above the crowd and attract new guests to any promotional event. Learn more. Memorable tastes are big, bold, and unique – and so are the custom restaurant and bar signs SpeedPro Imaging can produce for your business. See some examples in our portfolio for inspiration, or contact us with your idea. Together, we can get your message on the menu.